I wish I could give it a 10....so I wouldn't sound like a broken record. I have been complaining about the heat since June. It has been a boring summer, stuck in the house most of the day. 1=eh. I had Aunts and Uncles and I am an aunt to 2 nieces and 2 nephews. Uncle Bucky was my favorite . He was a big gruff teddy bear, who had a story for everything. When we were younger, he had a big gold front tooth, that I always though was attractive.....???? I wanted to know how to get one. He told me that when he was my age and he lost his front tooth, it came in gold, because he never, ever stuck his tongue in the space. Of course, I had 2 chances for a gold tooth and was never successful. My niece Megan was about one and sitting in the highchair eating at our house. Our puppy at the time Tai was a jumper and he was jumping up at Megan making her anxious. Mr BC yelled NO Tai, and Megan began crying. It wasn't her he was yelling at, but, she wouldn't have it....She wouldn't smile or go to him until she was about 3 years old. I still tease him that she loves me best. 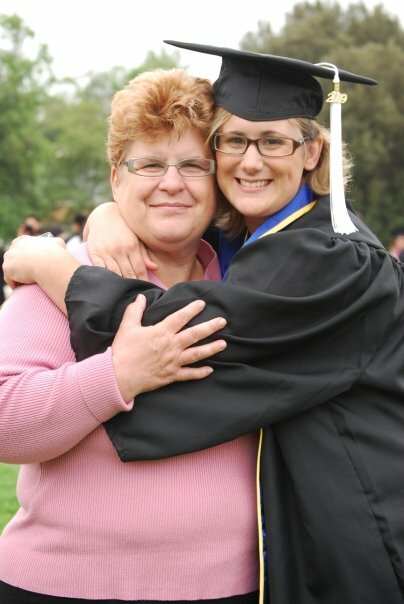 Megan and Aunt Katie, she still loves me most! I haven't had one for a while but I love chocolate dipped frozen Bananas. Bread dipped in fondue cheese is great. I haven't had that for a while either. 4. When were you last astonished by something? Explain. No explanation needed....Trump making it so far in the presidential run-up. I am astonished and dismayed, there is a chance he could win. 5. Surf board, paddle board, ironing board, Pinterest board, score board, clip board, bulletin board...which board have you most recently encountered? I keep some of Mr BCs health information on a clip board, also information on emergency procedures, so that it is close at hand. David and Goliath: David, a young boy, kills Goliath, a giant, with a stone, by faith. Boston, New York, Philadelphia, San Francisco, Anchorage. I've been to San Francisco, but I love it. The other cities would be new to me. I really like Michele Obama, I think she is a fantastic First Lady, Mother and Human. It was when my so called Facebook friends started posting mean things about her that I started hiding them. Cute story about your niece. It's amazing what things can make long-lasting impressions! I like the picture of the 2 of you. Blessings to you and I hope your weather cools down. It's been brutal. ...Been stuck in the house here, too. So ready for fall weather! 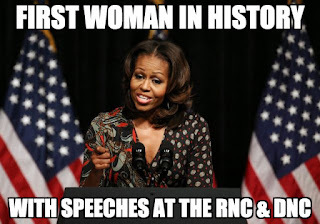 I too love Michelle Obama, such a classy First Lady! This weather is totally unbearable. I can't wait for winter, where we have a chance of it cooling down. It never gets really cold here. I agree is is astonishing that Trump has come as far as he has. Whenever one states am opinion, about almost anything these days, the haters are going to come out. Sometimes, even when we don't say anything, the negative comments will come out. There's nothing to dislike about Michelle Obama. We could do with a few like her in my country. I love the "cartoon" about the surf board/ironing board!! I hate heat too. I always taught summer school. I am so lazy during the summer. Of course, that is my excuse. I hope to get out and see a few flicks. Thankfully, we don't all have to agree on political issues to be friends on the Hodgepodge. 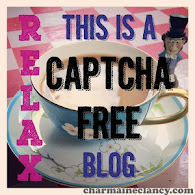 I am your neighbor on the blog list and enjoyed reading your answers. Also, being from the deep humid south, we know about this heat. So grateful we are getting a little reprieve this week from the 100+ temps. Hello! Thank you for visiting my blog page. 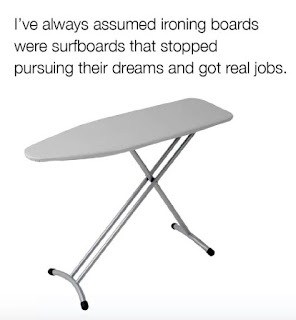 I laughed when I saw the picture of the ironing board and read the caption. Regarding your answer to #8, I can't say that I'm a fan of the First Lady's political views but I think that she's a wonderful wife, mother and role mode for her, as well as other, girls. I hate it that people would denigrate you, or anyone for that matter, because you may hold a different opinion than theirs. I urge you to continue to express your views. It's your God given right to do so and no one can take that away from you...unless you let them! Enjoy the rest of your week.